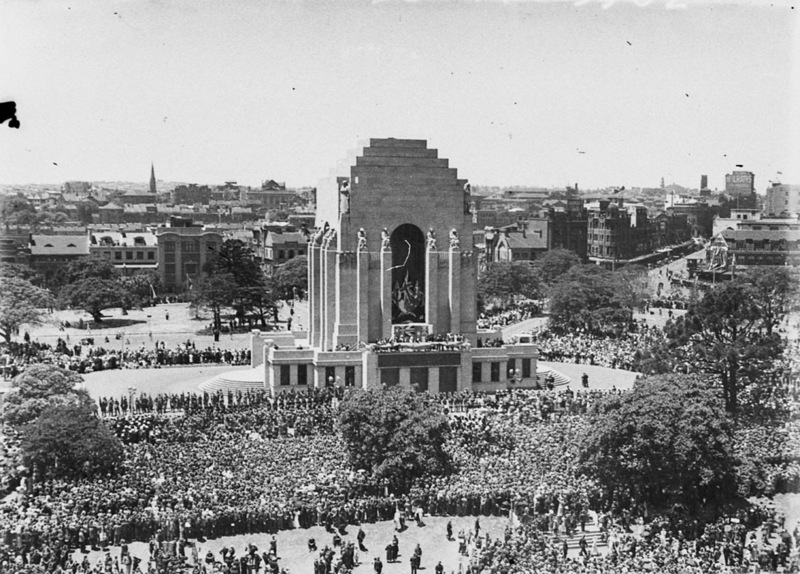 The Anzac Memorial was opened and dedicated by the Duke of Gloucester on 24 November, 1934. The original wreath laid at the opening ceremony by the Duke of Gloucester is displayed in the Memorial’s Hall of Memory. The ceremony was attended by an estimated crowd of 100,000 people. Notable attendees of the ceremony include the Premier of NSW, Bertram Stevens, the leader of the opposition Jack Lang, the Lord Mayor of Sydney Alfred Parker and the deputy governor of the Commonwealth Bank of Australia Mr. H. T. Armitage. The presidents of significant veterans associations were also present at the ceremony including Mr Leonard Robb the president of the NSW branch of the RSSILA (now known as the RSL), the president of the Limbless Soldiers’ Association, NSW Mr George Martin Farrow CBE and the President of the T.B. Soldier’s association Mr. William Cridland. To mark the completion of the Memorial, the Trustees published The Book of the Anzac Memorial to commemorate and explain the symbolism of the Memorial.